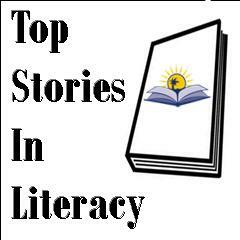 Call to advocacy for adult literacy! As part of FLC’s Social Media Month, FLC has put together tips and strategies for using social media platforms as a nonprofit organization. If you’ve missed the first two webinars, check out the Twitter webinar on Thursday, November 21 at 12 p.m. 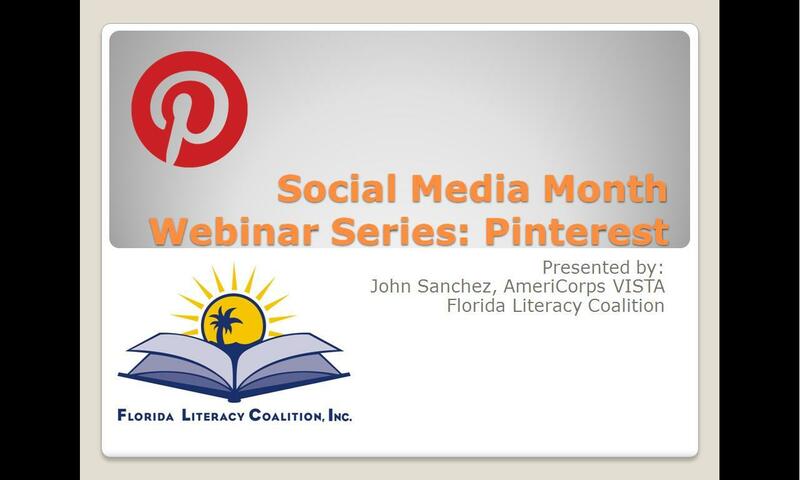 This week we provided a webinar on the 3rd most popular social media site in America: Pinterest! Pinterest is an image-based social media site that was created in 2010 where users can share photos with their followers and create collections of photos based on a theme. Each individual image is called a “pin” and the collection on which the pin is posted is called a “pin board.” A user that follows another can decide to share a specific pin with their followers and “re-pin” it to one of their boards. Finally, there are “likes” and “comments” that function the same way as they do on Facebook. Pinterest users are more often than not women. They make up 80% of the 700 million users on the site. Pinterest is beneficial for nonprofits for several reasons. Pinterest is known for having outstanding SEO (Search Engine Optimization). This allows for an accounts pin board to be found from an ordinary Google search even when the person who searched it doesn’t use Pinterest. The site also directs back pins to where they first were originated, so it’s a good idea to pin content that originated on your website or blog—this will take a user who clicks the pin to be brought to your organization’s site. Driving traffic back to your website so that people can read about your mission and what your organization does is one of the biggest reasons why businesses use Pinterest. In fact, Forbes has found that Pinterest pins can significantly drive sales. Why not drive donations too? There are some things to keep in mind when you’re beginning to choose content for your Pinterest. Above all, remember that Pinterest is a photo-sharing site. Articles and blog posts aren’t going to be as popular here, so if you want to post a blog on Pinterest, make sure to have some sort of image that people would want to re-blog. Photos of a tutor or student who has completed their GED are also good ways to supplement a blog post. Other useful content to post are Infographics and Inspiring Quotes. Infographics are basically a graphical representation of statistics about a certain theme. You can find inspiring quotes with a simple Google search, and then use Quozio.com to make them look more appealing. Infographics can be found at Visual.ly or Infogr.am. The latter allows you to create a basic account and try your hand at making literacy infographics. Useful Pinterest accounts to follow include Larry Ferlazzo, GCFLEarnFree, and ABC Life Literacy. The first results from the PIAAC survey is 466 pages, so no one expected you to read it overnight. Luckily several people in the field of education and economic development have done some of the reading for us and compiled their findings. The Florida Literacy Coalition is pleased to invite adult education students in Florida to participate in this year’s Adult Learner Day on May 8, 2013 from 8:30- 5:00 pm. Adult Learner Day is a unique initiative brings together approximately 70-90 adult learners from adult literacy programs throughout Florida. Students are invited to attend 5-6 special Adult Learner Day workshops providing information about a variety of life skill oriented topics. Adult learners are involved in planning and coordinating this event. The day always includes presentations by adult learners for their fellow students and adult educators. This event is free for students and promises to include a few surprises along the way. Join members from the Adult Learner Committee in this interactive workshop as they discuss why they stayed with their literacy programs. This workshop will provide insight on how practitioners can increase student retention and recruitment. Be prepared to participate in this informative conversation! Does the term finance scare you? Jaclyn Boland and FLC AmeriCorps* VISTA’s will help you get a better understanding of managing your money and creating a budget. After participating in this workshop, you will walk away with tools that will help you plan for your future. From the basics to the necessities, learn how to use a computer in ways that will help you succeed. This workshop will start with how to turn on a computer and end with copy and paste, and keyboarding. Learn how you can use the library and find information that will help you in your learning process. You will learn how to find information on things like citizenship and health literacy. All learners are welcome to this presentation. Reading to your child is a remarkable moment. This workshop will teach you reading strategies that will help you read a book to your child. Leave this workshop with a book to take home and practice tonight! 21st century, adult literacy education (including English for immigrants) must integrate digital literacy, a new set of core literacy skills, with existing curricula. While reading, writing and numeracy are still essential, adults now also need to be comfortable and competent in using technology for daily living, work, higher education and lifelong learning and training. However, many adult literacy education teachers are not well prepared to integrate the use of technology in their classes, and many adult literacy education programs and schools cannot afford and/or do not know how best to use state-of-the art technology. The effective use and integration of digital technology in teaching and learning is now essential to prepare adult basic education learners for opportunities in work, vocational training and apprenticeship, and post-secondary education. Miss opportunities to find jobs, and apply for college. Increasingly jobs are advertised and applied for online. In some cases only online applications are accepted. College admission applications and financial aid application are now most often made online. Miss the opportunity to learn online. Adults who do not have digital literacy skills cannot take advantage of free or inexpensive, high quality online and blended learning through which they can improve their basic skills, including English for immigrants. Cannot engage with and are isolated from local and global communities and family members. Children use text messaging, social networking websites such as Facebook, and Twitter: parents need to keep an eye on those activities. Schools reach out to parents by email, and community groups use online networking and social media to organize and promote community events. Immigrants use Skype to make free calls and to videoconference with relatives in their home countries. Each of these is an example of the ways that the inability to use technology will limit adults’ ability to be active, engaged parents, family members and members of the broader community. Require that programs offer all adult learners basic digital literacy skills (including, for example: how to navigate the worldwide web; search for and evaluate information online; send and receive email; make good use of online learning; and use basic tools such as word processing, spreadsheets and email) so that they can be competent and comfortable in computer based testing; apply online for, and succeed in, post-secondary education; and use computers and other web-accessible devices in the workplace. Provide funding for teacher training and for hardware and software to enable programs to successfully accommodate those with learning disabilities, through assistive technology and universal design. Provide funding to Increase programs’ hours per week of instruction) through blended (face-to-face and online) learning that will enable learners to progress more quickly. Learners who have more time for learning, because of unemployment or other reasons, can increase their basic skills learning intensity through online learning. Provide funding for web-based professional development for teachers who want to be effective in blending online and face-to-face instruction. 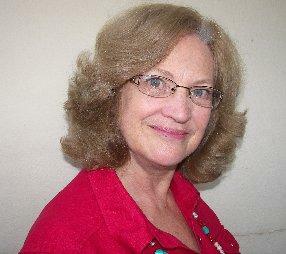 Provide funding to develop adult basic education open education resources that support blended learning. Seniors gather at the Hallmark, their assisted-living facility in Lower Manhattan, for computer classes. They wanted to begin the task of catching up with a technical world whose rapid-fire evolution has left much of America’s oldest generation isolated from its children, grandchildren and tech-savvy friends. The contest was designed to tap the talent and creativity of teens across the U.S. to raise awareness of the importance of being smart about money, and to spread the word about the financial education program Money Matters: Make It CountSM available through all 2,900 Boys & Girls Clubs that serve teens. In its new $250 million initiative program called AT&T Aspire, the company aims to help young and driven students to graduate from high school with the technological tools and skills they need to advance into a successful career. Find out how to apply! The failure to find tech-savvy talent is preventing U.S. companies from innovating their way out of their current financial doldrums. A survey by Moritz’s firm found that 57 percent of U.S. CEOs said that creating and fostering a skilled workforce should be a top government priority. President Barack Obama’s recent proposal to “train 2 million Americans with skills that will lead directly to a job” barely scratches the surface of one of the nation’s most vexing labor problems. Women at all levels of literacy tend to have lower wages than comparable men, but the gender wage gap is most noticeable between men and women of low literacy levels. Nora Sanders of Shelbyville has been named the Adult Learner of the Year by the Commission on Adult Basic Education (COABE). Sanders was named Tennessee Adult Learner of the Year last fall and was selected from COABE from among other state winners. The percentage of adults 55 and older in adult literacy/basic education programs has doubled since the economic downturn in 2008, says a new report from ProLiteracy and Senior Service America. The House and Senate are debating a provision that would tie unemployment benefits to a high school diploma or a GED and to drug testing. Family literacy is one of the most important things for an educated society. Children learn from their parents’ actions. Educating adults means educating families. When it comes to Florida’s jobs, more than 85 percent do not require a four-year degree, according to data from the state’s “Workforce Estimating” conference earlier this month. The internet allows for critical engagement between printed text and readers. Enthusiasts of particular series are able to learn more and talk to other fans about their ideas in the stories while building digital literacy. Ann Scott kicked off the 2012 statewide Celebrate Literacy Week, Florida! on Monday at Sarasota Middle School. The goal for this year is to have students read 20 million minutes. It’s a rare student who comes into my ABE/GED classroom without the intention to get a job or get a better job. Students are well aware that without strong literacy skills and a high school diploma or GED, their career options are really limited. However, I find that only a few have clear understandings of what jobs may be available, or what skills are necessary for those jobs. For many, the motivator is something like: “I hear you can make good money as a _______”. 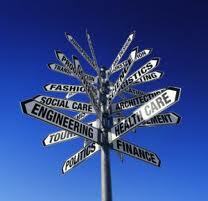 Rarely do students have a clear view of the variety of careers available. As teachers, we need to help them get this information. Students also tend to think of the skills they are learning as something for “the test” and disconnected from the skills they would need for a career or for life. As teachers, we need to bring students closer to the understanding that while the skills we are teaching are for “the test”, they apply to the world of work as well. An easy way to fill both these needs is to train yourself to use examples which emphasize career reference. For instance, instead of “The dog (ran, is running, will run) down the street yesterday”, how about “The computer technician (ran, is running, will run) a virus check on my computer yesterday”? Instead of “One third of the 75 books were fiction”, how about “One third of the 75 prescriptions filled by the pharmacy tech were antibiotics”? As we teach, we need to constantly use career references in our examples and skills practice so that our students become familiar with various occupations and relate the skills they are learning to those occupations. Another way to incorporate career awareness into skills teaching is to structure lessons around a certain occupation. Take a few minutes to do a quick internet search for information on an occupation, especially one with high job availability in Florida. Copy or rewrite an article on a radiologist, mix up the paragraphs, and have the students put them in the correct order. Copy or rewrite a paragraph about legal assistants, leave out the commas and have students correct it. Use truck drivers or transportation for questions dealing with the distance/ rate/time formula, calculating miles per gallon, or figuring gas cost per trip. No matter what individual skill your students need or what level you are teaching, you will increase your students’ interest and knowledge by incorporating career awareness into your daily curriculum.